This February, The DH Ensemble will embark on a UK tour with the heart-warming adaptation of Randall de Sève’s best-selling book, Mathilda and the Orange Balloon. 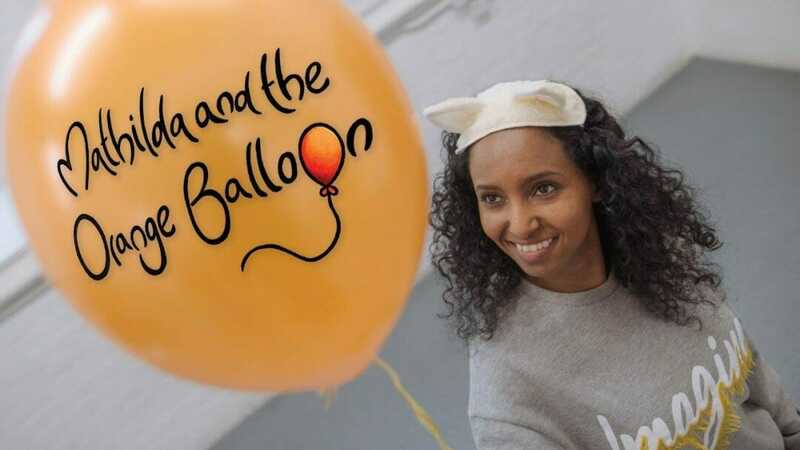 Hermon Berhane appears in the production, and tells us more about how The DH Ensemble have made Mathilda’s world fully welcoming and accessible to D/deaf and hearing children and their families. Tour dates and tickets here. The DH Ensemble are taking Mathilda and the Orange Balloon out on tour, what can you tell us about it? Mathilda and the Orange Balloon is a new family show based on a children’s book. Mathilda lives in a small world with green grass, a green barn, grey stones, and lots of grey sheep. One day Mathilda sees an orange balloon floating in the air – she had never seen anything so magnificent before. Suddenly, Mathilda has a new thought: “Orange balloon . . . That’s me!” The other sheep laugh: “You’re a grey sheep, and you’ll always be a grey sheep.” But Mathilda disagrees. She identifies with the balloon and suddenly finds that with a little imagination, she can fly, and that she’s tough like an orange tiger, and as warm as the sun. And if she can be an orange balloon, she can be anything. Mathilda is a wonderful story about the power of dreams and one’s imagination. How did you get involved with The DH Ensemble? I was lucky enough to work with The DH ensemble during my first research and development project and performed at The Liberty Festival in Olympic Park in 2016. Then, I was cast in their show People of the Eye, an autobiographical story about writer Erin Siobhan Hutching’s family and their journey into the Deaf world, which went on two UK tours. I love working with the team because the company is led by Deaf and hearing artists and everybody’s opinion is valued and considered during a rehearsal process. What are the challenges of taking this show out on tour? The challenges are doing justice to the wonderful children’s book the show is based on and interacting with the young audiences on tour – in particular during the section at the end of the show where they are invited to play on the interactive farmyard set! How do you go about making the production accessible to D/deaf and hearing children and their families? The production uses Spoken English, British Sign Language and animation (projection). The story-telling is simple yet visually very strong, which makes the production inclusive to all. What would you say to anyone thinking of coming to see Mathilda and the Orange Balloon? It is an absolutely joyous play. Mathilda’s story is so important to share with young audiences as it encourages them to be positive about themselves and others, to accept that we are all different and to believe that ANYTHING IS POSSIBLE. You can have big dreams – you just need to use your imagination and believe in yourself.